For information regarding the organization of events at the Auditorium please click here. The transformation of a pre-existing structure in a space for music always constitute a sort of miracle. The re-opening after renovation of historical buildings, churches, or industrial sites that are saved from a seemingly unavoidable destiny of abandonment often becomes an event even more awaited than the inauguration of brand new ones. Likewise, Carmine Auditorium's, austere and silent presence that for centuries had stood besides the lively and loud Conservatory now revived by the enlivening energy of its music has become a primary meeting and cultural site for the city of Parma. This fascinating space, characterized by the gothic frame of the architecture, has been redesigned to allow for the creation of a stage and of a seating area that are suitable for the performance of music. The acoustic furnishing - counterposed, with its technological profile, to the solemnity of the pointed arches - has resolved the many problems and unpredictable sound perspectives characteristic of a building with a very partitioned body . The showy adjustable panels, constructed out of the same pine wood with which bowed instruments are manufactured, can model an imaginary harmonic box/container, that varies according to the kind of music that will be performed. 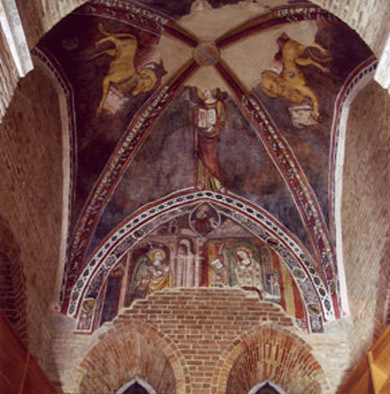 The first church and the first convent of the Carmine were built in 1273, thanks to a generous donation by Lanfranco Bacchetti that left all of his riches so that the carmelitano order, that had not been present in Parma before, would settle in the city. Subsequently “the Senate Parmesan, under the Prevostura of Giacomo Mandriano, once it obtained the licence from the Senate of Milan in approximately year 1334, gave its permission to the fathers of advancing themselves over the wall of the Parma Torrent, with the objective of bringing the Convent and the Church to greater improvements; and to a more noble symmetry “. The bell tower was constructed in 1565, also with the support of the local administration, Comune di Parma. The biggest of the convent's courtyard was definitively upgraded/fixed in 1583, like the vestry which was erected in doric order. The church map turns out to be quite irregular due to the successive addition of lateral chapels, some in the gothic style, and others in the style of the renaissance, all more or less rehashed in the baroque age. The late gothic frescoes have been teared, nearly integrally, and placed in the National Gallery's warehouse . 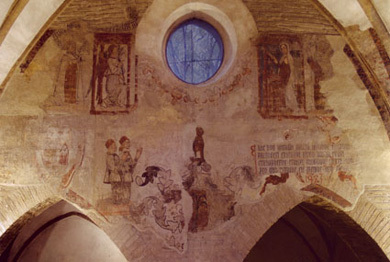 They usually are testament to the Lombardic influence - particularly of Foppa - and tended to exalt, also pictorially, the gothic architecture of the vault. They are all datable to around 1480 approximately. Fragments that therefore testify a particular vitality, not only religious, but also cultural in nature. 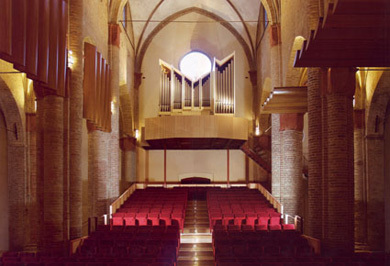 The Weigle organ in Parma Conservatory's Auditorium answers to a particularly interesting phonic criterion with its adaptability to any organistic repertoire: the instrument, manufactured by one of the great German organ makers, features 30 disposed real registries on 3 manual ones and pedal on a rigorously classical base according to the canons set by the great Germanic tradition but tuned in such a way to allow for the faithful translation of the various European organistic repertoires. The instrument's position at the Carmine Church, now Auditorium, in the gallery on top of the entrance, mirrors exactly the original placing of nordic organs, according to their optimal phonic performance. All this makes this organ quite exclusive in so far as musical production within the contemporary Italian conservatory scene as the most diverse genres can be performed with this instrument. The Carmine Auditorium can be rented by private and public agencies for events of cultural, musical, artistic, scientific, didactic, and professional nature. For information regarding the use of the Auditorium, please write to the following address: ufficio.produzione@conservatorio.pr.it, after having read the contract's Terms and Conditions and filling out the technical form attached. For internal organizational reasons, only requests submitted in writing will be considered, please do not request information by telephone.